Brilliant day at DigIn today. Sharp frost overnight provided an icy pond, but a blue sky sunshine morning soon had us all warmed up. 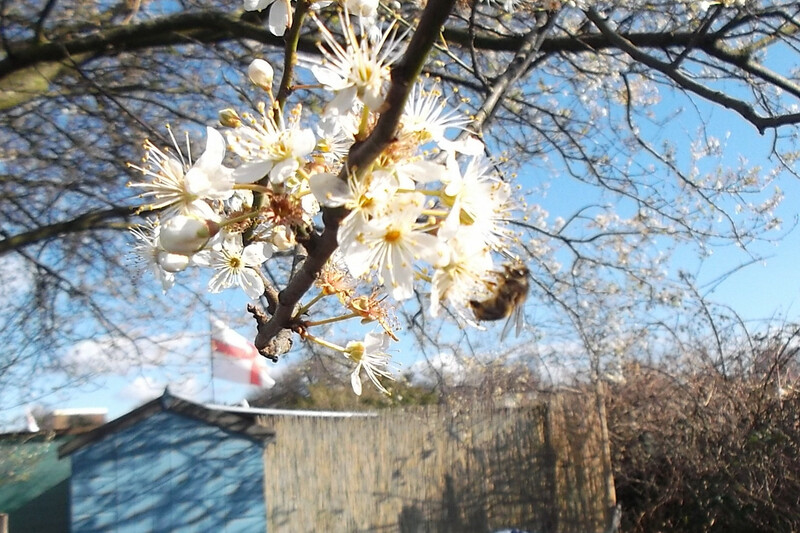 Even the honey bees were out & about enjoying the pollen and nectar on our Mirabelle tree. 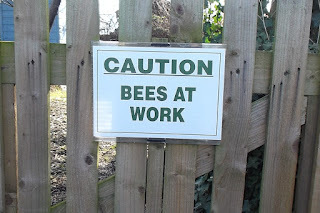 Their hard work should ensure a good crop later in the season. The Mirabelle tree was also playing host to some house-hunters - some BlueTits were spotted having a look round a rather des. res. in the form of the nesting box put up in the tree last winter - lets hope they take up residence. 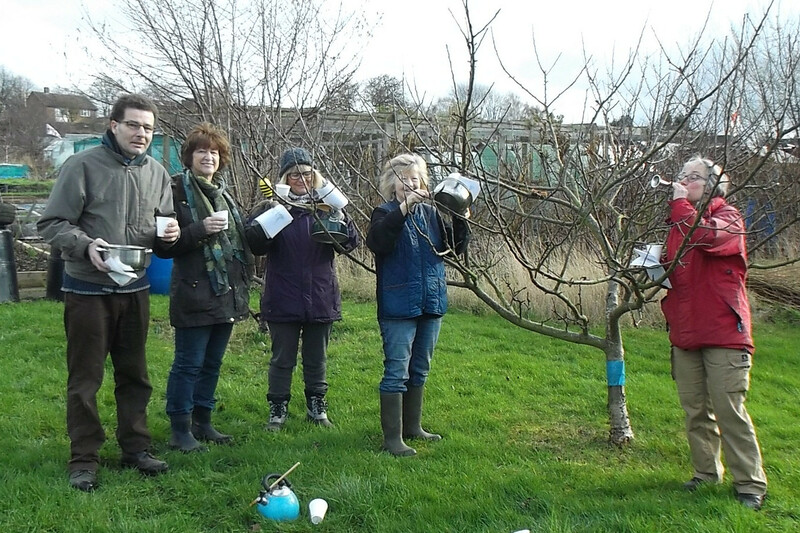 We decided to Wassail our apple trees in the orchard, a little late according to tradition, but it shouldn't really matter! 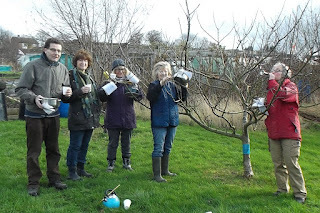 A group of volunteers gathered to bless the fruit trees, this involved drinking warm mulled apple juice /cider and singing and reading traditional rhymes to the trees in the hope that they will provide a good harvest in the autumn. A piece of cider soaked toast was placed in each tree and lots of noise made by banging saucepans, kettles and blowing horns to fighten away any evil spirits lurking in and around the trees. Lets hope the trees respond favourably and didn't mind our singing too much! Ever wondered what to do with those hollow prunings? We've recently pruned our Pheasant Berry shrub (Leycesteria formosa) the stems of which are hollow. These will provide an ideal habitat for little critters to shelter in. 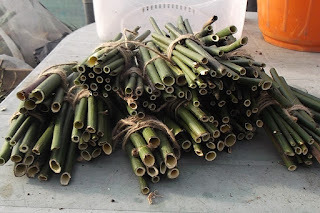 We have started to bundle the prunings together and will use them to form bug hotels. 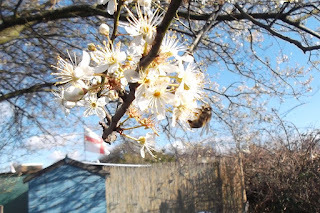 So, not only will the shrub look better this coming year - it has wonderful flowers followed by berries - but will be helping biodiversity on the allotment. Lets hope some beneficial insects take up residence! 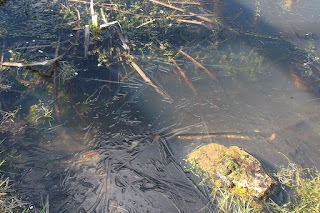 The mild weather this winter has caused all sorts of interesting things to flower early. 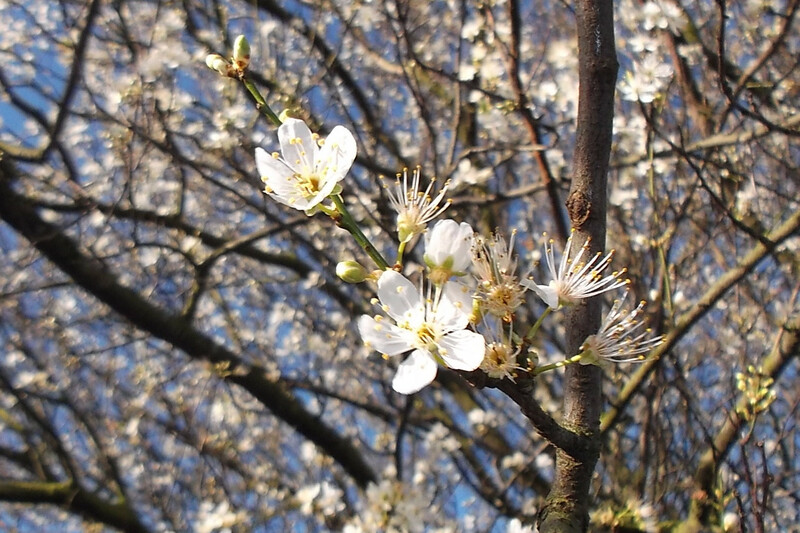 Here's a pic of the blossom on the Mirabelle tree (I think that's what it is ... ) at Dig In. 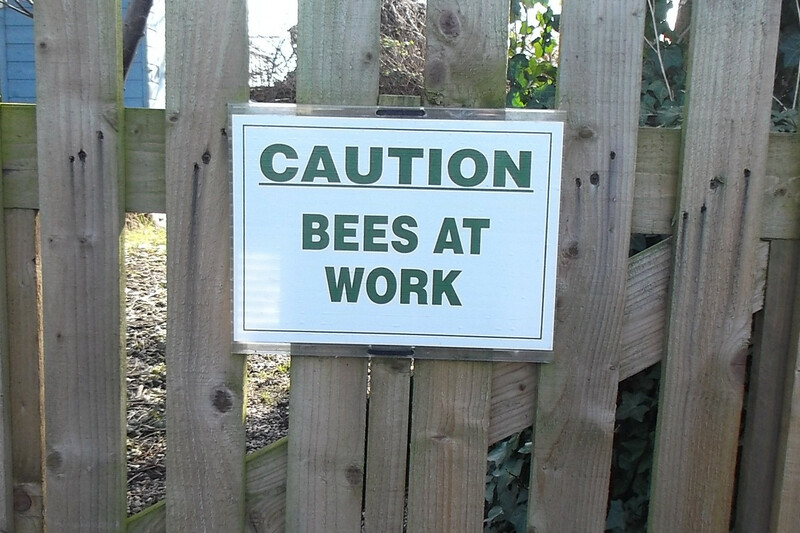 Just hope there are enough pollinators around so that we get some fruit in the summer.